For you who don't know who Manon Grandjean is, she is the engineer for producer Fraser T Smith (Adele, Sam Smith and many others). 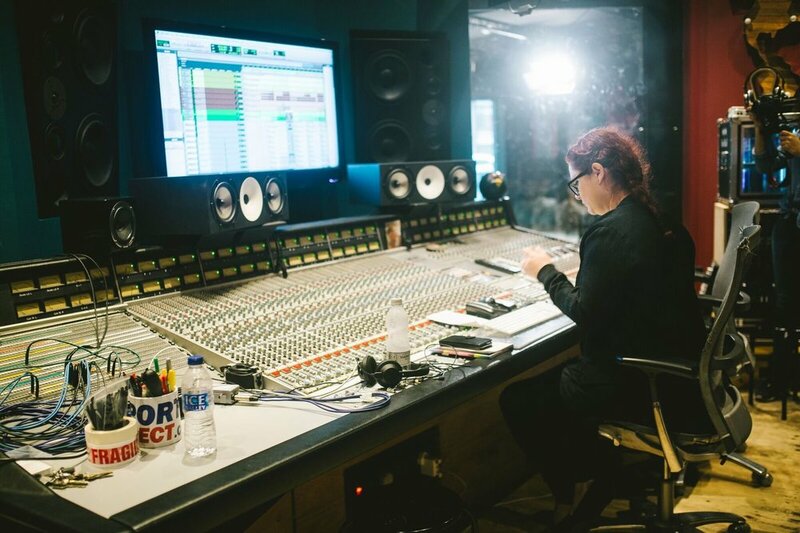 She also won the Breakthrough Engineer of the Year at the MPG Awards this year and she has engineered for bands such as London Grammar, Gavin James and the latest number 1 record - Gang Signs & Prayer - by Stormzy. I'm sure there will be many more hit records coming from her in the future. 1. When did you realise you wanted to become an engineer? When I was 16-17 I realised I wanted to become a sound engineer as I loved music and was following a scientific/technical path in my studies but I just had a vague idea of what the job was. When I was studying physics at University I did an internship in a recording studio in Marseille. At the time I didn't really know much about microphones and recording techniques etc… for a couple of months I followed the owner of that studio and learned a lot, learned exactly what a recording engineer and mixer do and I knew that's what I wanted to do. I went on studying audio engineering for 3 years after that at University in Brittany. 2. Were you involved in music before becoming an engineer? From a young age, I was really interested in music so I was trained on piano and harp for a couple of years and then I went on classical guitar for 7 years. I wasn't involved in music professionally before becoming an engineer. 3.Why did you make the move to London from France? At the end of my audio engineering studies, I got a 2 months internship in Livingston Studios in London. So I came here thinking it was a great opportunity and a great adventure. At the end of it, they offered me some freelance work and that was the beginning of everything. I didn't have any job to go back to in France so I decided to take the plunge. 4.How did you get your foot in the industry? It all started with the internship at Livingston, I got to learn from great engineers and also learn about studio etiquette. From the back of that, I got some freelance work at State Of The Ark Studios and then RAK Studios. 5. How were those first 3-5 years of just starting as an engineer and moving to London? The beginning was really hard, there wasn't a lot of work and I wanted to be in studios so I had to start from the bottom, as a runner and then as an assistant. I wasn't doing any sessions as an engineer for the first few years. When you want to work in big studios you have to be patient and engineering isn't going to be your main role for a few years. 6. What was the biggest learning curve? I feel that the biggest learning curve for me was to try to read people, anticipate what they would want or need. Besides the technical aspect of it, this was my main job for a few years and this is something that in my opinion they don't teach you anywhere. Psychology is a big part of the job, as a runner, an assistant, and an engineer. 7. What is your mental approach when going into a session? I personally don't have a mental approach or routine, I just try to be as prepared as possible. That can consist of getting in touch with engineers, musicians, or producers beforehand…and preparing your Pro Tools sessions, patch list etc. 8. You studied classical guitar, has that helped you in sessions? I was really young when I started playing the guitar so I never was in a professional environment, but I think it helped with musicality and understanding musicians. 9. Do you still practise the guitar? I stopped playing when I started studying audio engineering, I always was very nervous playing in front of other people and I felt that engineering and the technical path suited me more. 10. Which moment did you go " wow, I didn't know that" which is now a part of your skill set? In my opinion, I am learning new skills every day either by watching other people work or by being in a new situation or facing a new problem that forces me to take a new approach. This is a perk of the job that every day is different. 11. What would you say is the most important thing that an engineer needs to get right in every session? 12. I guess you had a few runners and assistants working for you, what makes them progress and what gets them fired? In my experience, assistants or runners never got fired when they made a technical mistake, but their personality and how they behave in a session is usually what determines if they are gonna get the callback. 13. Being a woman, have you ever felt that has held you back? I personally never experienced that, I was lucky perhaps to work with great people who didn't see my gender as an issue. And I want to show people that discrimination against women is the exception, not the rule. It is a male dominated industry but again great workshops and movements are in place now to get more women involved and make a change. 14. What would you identify the main tool that great engineer uses that separates them from the rest? I think dedication is definitely a factor, being flexible not set in your ways as well. I understanding your weaknesses and working on them is also key. 15. How do you balance your busy life with your private life? I think balancing your work and private life is always a challenge and I think you have to be prepared to make sacrifices. 16. What would you say to those who are a few years in and still trying to figure out how this business works? I would say keep learning, get as much experience as possible. work hard and stay humble. Now I want to hear from you! Who would you like me to interview next? Let me know in the comments below. Get Your Free Guide - Why Use Compression - Now!